Pepler’s remarks were scarce on details, as he didn’t say anything about the available content or the monthly price of the service. However, Pepler did say that the company will work with current partners and “explore models with new partners” for the service. Those may be first hints as to how HBO is approaching this space, and how an unbundled [company]HBO[/company] Go will differ from [company]Netflix[/company]. In the past, HBO executives have time and again said that they’re not willing to unbundle because they value the relationship with TV operators. Under its current model, HBO doesn’t have to worry about signing up, billing or retaining customers directly — all of this is handled by TV operators like Comcast and Time Warner Cable. Some of these operators have in the past few months experimented with basic cable bundles that include HBO to offer consumers a package for roughly $40 that still gets them Game of Thrones. It’s possible that HBO would continue to sell its “unbundled” plan through ISPs rather than signing up customers on the web, with the difference that consumers would be able to sign up just for HBO and internet, and not need to rent a cable box, or add local channels they may not watch or want to pay for. 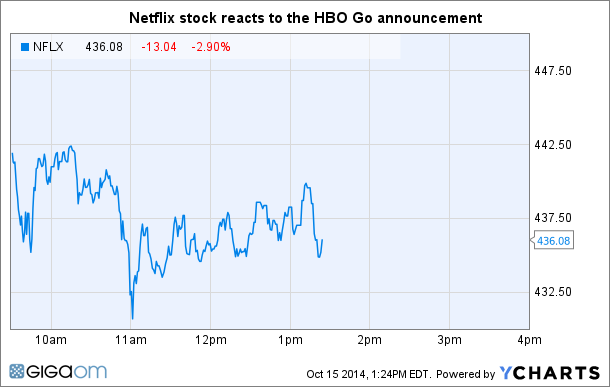 Update: Netflix’s stock fell on the news of HBO entering the standalone streaming business. Netflix is also announcing its earnings later today, so we’ll see how the streaming giant is taking the news of its new competitor. Bundling on the internet should have something not present in Cable though – options. So I can only get HBO if I also get ESPN or something? OK. Great. I’ll just stay with my Netflix thanks. The pricing for HBO will be interesting. I suspect they will value themselves higher than the market will. Until the past year, when cable companies seem to almost pay you to take HBO, it has not been that cheap. I think if HBO comes over-the-top carrying a price of $15 or $20/month they are going to be surprised at how unwelcome it is. The thing about HBO GO is that it has all their old shows. Some of them classics. That’s great if you never got around to watching them. Or if you’ve seen the old one but are really curious about this Game of Thrones you keep hearing about. But once you’ve seen all the HBO original content then it’s just a few new B movies and one or two newer movies a month. I’d probably rather have the deep and wide oldies catalog of Netflix. What would be brilliant and very unexpected would be if they bundled with Netflix as an option. Netflix helping them to manage billing and whatnot. Netflix plus HBO for $15/month. That might be cool. If these are bundled with Internet packages, I think it will be a lot less impactful. If someone wants to subscribe or unsubscribe from Netflix, it’s as easy as a click of a button on their website. The pain of adding and removing HBO will continue if it’s bundled. I added it on my brother’s TWC account a couple months ago via the website. He received an email that they’d look into it in the next 24 hours. Then it never got turned on until he called a week later. Then they still charged him for the days when it wasn’t working. Now, he’s turning it off. This requires calling up TWC and convincing a rep to let you turn it off. Do they really want their brand to be harmed over and over, day in and day out, by it’s association with this kind of customer experience? I’m seriously hoping they are smart enough to provide a true standalone solution, with absolutely no association with cable providers. There is more to disconnecting from the cable bundle than bundling with internet packages. Janko, any idea what the pricing for unbundled HBO is in Scandinavia and how it compares with the Netflix’ pricing in the same market(s)? Reed Hastings talked about this during today’s Netflix earnings call, and said HBO Nordics was priced “on top” of the local Netflix pricing, which I guess meant it’s more. Not sure how much it actually is, to be honest. No problem, I actually read a comment on Slashdot later from someone that uses the service who said it’s around $112/year, considering current exchange rates. So it sounds fairly competitive with Netflix pricing. Thanks! The translation on this is HBO’s perceived value is far more than their actual value in the marketplace and as such the price point for Internet bundles will be far higher than consumers are willing to pay. I got rid of HBO a while back and just never missed them in the interim. So there you go.